You love boating, but do your kids? How can you instill your passion for the water in them? Yes, you can take them on a fishing trip or bring them on the boat, but are you doing it in a way that will make them want to be there or do you have to drag them kicking and screaming? Many say if your child hasn’t been bitten by the bug by the age of 13, it might not happen. So how can you make sure your child wants to participate in your family activities on the water? There is a right way and a wrong way to introduce your kids to the water, but don’t worry, we are here to tell you how. The first rule of thumb, make sure the fishing and boating is fun! If their first experience is defined by confined boredom and a constant need to be quiet, still, and patient, chances are your child won’t want to do it again. When it comes to fishing and boating, parents need to be part buddy, part adventurer, and part mentor. Too many rules and regulations can make it a chore. Safety is always a big concern, but keeping your kids safe and teaching a love for the water doesn’t have to be hard. While wearing a life jacket is required by law for most boaters under the age of 16, there are plenty of Coast Guard approved life jackets that look cool and fit snuggly without restricting movement. Take your kids on a modest shopping spree to your local discount or marine store to pick one out in the right size and type for their body. Also, wear a life jacket yourself when out on the water. It is one of the best ways to get your children to understand its importance. When they’re enthusiastic about safety gear, the safe boater battle is won. Sunscreen is also an important part of fun, but don’t fret over the SPF. While companies tout SPF 30 or 70, the benefits of high-SPF sunscreens are dubious at best. An SPF 15 screens out 95 percent or more of the sun. An SPF of 30 may only increase protection to 97 percent of the exposure and the higher the SPF rating, the less accurate the testing. Go with the 30 or 70 if you feel better about it, but don’t feel like you’re under-doing it with SPF 15. Now for the fun! To teach your kids to love the water through fishing, you have to let them do it on their own terms. Get them one of the inexpensive fishing poles that come with a tackle box with hooks, sinkers, and bobbers. Make sure you pack a cooler with snacks, sandwiches, and something to drink. Take them to docks, piers or around stumps and logs along the bank where the fish like to hang out. You might have to take them off the boat and to a park pond, nearby stream, or public landing to teach them the skills of fishing. Make it an adventure, make it fun and the kids will want to do it again! You can also impart a love of the water by taking your kids out powerboating. It offers a view of the waterways most kids can’t resist. It is best to start with a young boater by providing a safe boarding experience. The boat should be securely moored to the pier and parents should board first. 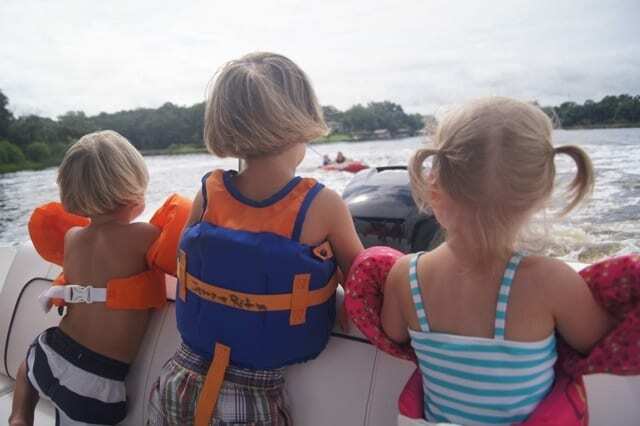 A younger boater or toddler can be handed directly into a parent’s waiting arms, giving them a sense of security. Since you never know if they will enjoy the experience, it is a good idea to ease way from the dock and proceed slowly until you are sure the child is loving the wind and the waves. Chances are they will soon be yelling for you go to faster. For more information on powerboating, pick up a copy of “Power Boating for Dummies.” It is available in print or digital format through amazon.com. You also need to teach the importance of boating smart. The three ingredients to safe boating are knowledge, sobriety and a properly fitting life jacket. While you are out boating with your kids, be sure to give them the basics of navigation, boating rules and safety preparations. You can always teach them through online boating courses, which are readily offered. Visit www.discoverboating.com/beginner/courses.aspx for more information on boating education. So, your young boaters are now really into the sport and are starting to ask for the keys to the boat. Most lifelong boaters remember driving the boat before driving the car and the experience is often more vivid in their memory. Rules on the minimum boating age vary by state, but one thing is consistent – new boaters need boater education to take the vessel out on their own. Here in Florida, there is no minimum age to operate a boat. However, if your child was born on or after January 1, 1988, they must pass an approved boater safety course. While at the helm, the young boater must carry a photo I.D. and boating safety identification card issued by the Florida Fish and Wildlife Conservation Commission. Follow these simple suggestions and you will hand down your love of the water to your child and groom a lifelong boater!